Wide soundstage, free from the speakers. Precise definition of instruments and performers in the soundstage. Better resolution with more distinction in the bass region. Can be fitted into any brand and model CD / SACD or DVD player. Even most DAT or CD-R recorders and separate D/A converters can be upgraded with this High Tech Clock module. Dual Clock Output with UHF plugs (SMB type). Instant Clock Signal, Main capacitor bank is delayed for trouble free integration in any CD / SACD or DVD player. 3V / 5V output level setting on board. 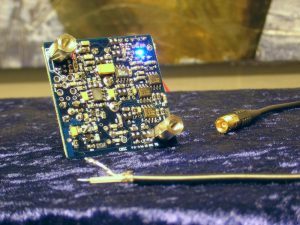 New Ultra Low Noise Voltage Reference from Analogue Devices. RG174 COAX cable with SMB plug included in each kit. New Ultra Fast (5,2ns) Voltage Comparator (with factor 10 better signal/noise performance compared with XO2). Disable function for DVD players with Standby mode. 4 separate Voltage regulators, compared to 2 in XO 2. 4 layer circuit board with two noise screening planes inside. 1 ppm accuracy (+/- 17 Hz for a 16,9344 MHz clock). Jitter factor 10 lower than other leading ref. Clock. 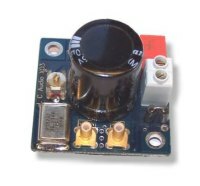 Voltage monitor with Blue 'OK' LED. Advanced Low Noise Design (91 active parts - compared with 43 in XO 2). Click! XO 3's circuit board is 40% smaller than our previous XO 2 clock. This is made possible by advanced 4 layer circuit board technology. 85 SMD parts are mounted as closely together as possible to keep signal path short, and thus reduce digital noise injection from the CD or DVD player. Click! The clock signal is supplied from the XO 3 with a plug of this type, intended for low loss Ultra High Frequency termination up to 5 GHz. So the losses and jitter contribution at the actual clock frequencies of 8 - 45 MHz are practically non existent. The plug is only 3,3 mm (0,120") in diameter, and the highly flexible coax cable (RG174) are 2,8 mm (0,102") in diameter. Perfect for mounting in any CD / SACD / DVD player! Click! A blue LED indicates 'POWER condition OK'. Click! In your CD player the crystal in the factory clock runs on square waves on the input terminal. This does not allow optimal performance of the crystal. In LClock XO 3 the crystal controls a pure sine wave oscillator for optimum operating conditions, and perfect low jitter performance. This is the actual signal taken off the sinus oscillator of a 16,9344 MHz LClock XO 3. Click! 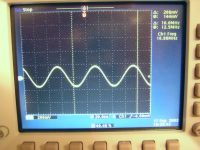 After the sine wave oscillator the signal is fed to an ultra fast and low noise voltage comparator. This chip transforms the sinus into a square wave, this is one of the most critical parts of the XO 3 circuitry, and this circuit alone has 2 precision voltages regulators, to keep it ultra stable. Then after a simple logic buffer the square wave is fed to the coax cable. This is the actual clock signal as can be seen at the CD end of the coax cable. This measurement is taken in 3.3 V mode for SACD / DVD players. The XO 3 can also be set in 5 V mode for use in CD players. See below. XO 3 is the only clock in the world offering this function, and giving a trouble free installation in any model. Click! Output from LClock XO 3 in 5 V mode for CD players. See below for details on how to set this mode. Click! 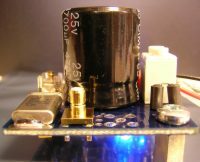 5.00 V mode is set by shorting this solder bubble on the XO 3 module. The voltage reference in XO 3 is ultra precise with a tolerance of just 6 mV. This means the 5.00 Volt supply is within 4.994 - 5.006 V more precise than even high end multimeters. Click! Start-up delay. 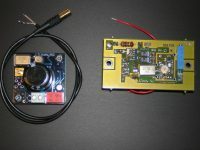 This scope shows the start-up procedure of LClock XO 3. The blue curve is the power supply, 0 - 10 V DC, the yellow curve is output from XO 3. As can be seen the clock signal is present less than 1 ms (1 / 1000 sec) after power up. This allows for trouble free installation in any CD / SACD or DVD player. There is a capacitor bank on the XO 3, working as a virtual battery supply. It can run the clock stable up to 2 seconds independent of the power supply, however this bank is slowly charged at start up, and the power is then looped over the capacitor after about 10 seconds when the cap bank is fully charged. Jitter is noise. Not voltage noise but time noise. If you vision a D/A converter with a low frequency output, or even a DC output, it is obvious that the voltage reference of that D/A converter is important in order to have a low output noise. 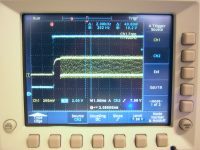 The noise of the voltage reference is added to the output signal. Maybe your D/A converter has a S/N ratio of 100 dB, but your reference has only 80 dB, so the resulting S/N is 80 dB, and you are not taking full advantage of your D/A converter's potential. Imagine a D/A converter with a high transient content, i.e. jumps from full plus to full minus in 2-3 samples. Now the voltage reference is not so crucial. In transient heavy signals the time reference comes in scope as the bottleneck for D/A performance, in exactly the same way as your voltage reference for low frequency signals. In audio players the typical D/A converter has a performance level of around 100 dB. The reference voltages are kept clean to accommodate this performance, using high grade regulators and big capacitors. However the clock signal or time reference is overseen in almost all players, even the more costly ones. Often cheap oscillators with a signal to noise ratio of 70 - 80 dB are seen in supposedly well built players. This does not allow you to take full advantage of your converters potential, and the reason we built the LClock XO 3 reference clock. Why is my CD / SACD / DVD player born with jitter? The clock in your player is most likely of the Pierce type, built with a 74HCU04 gate (check it out, look inside). This oscillator type is very simple to build, it works this way: the square wave from the output of a gate is sent to the crystal, that will make an oscillation accordingly, and it will send a small amplitude phase turned signal to the input of the gate. The phase turned signal has an amplitude of some 200 mV pp. There are 3 problems with this type of oscillator: first the square wave gives the crystal a lot of non-harmonics to work with, causing it to work out of its optimal working point. The 200 mV signal is amplified in a gate with around 5 mV pp resident noise, it is a gate, not an analog amplifier. 5 mV pp + half of the noise present on the VCC pin. (Since a gate of this type will trigger the input on 1/2 of the VCC). So this setup has a very poor Signal / Noise ratio, thus giving the oscillator a poor S/N ratio or high jitter level. The last problem is that the crystal has to run in the parallel resonance mode, where it has an impedance of several hundred kilo ohm. Airborne noise from inside the CD player (and there is a lot!) will have free access to the input of the Pierce oscillator, only stopped by the 200 k impedance of the crystal in parallel mode. Much better to run the crystal in series resonance mode, where the impedance is a few hundred ohms - 1000 times less susceptible to digital noise injections. So who knows about noise performance in oscillators better than radio amateurs, whose equipment depends very much on a low noise frequency reference. In the ANRR (American National Radio and Relay Association) technical compendium (to be found on most public libraries) the Pierce oscillator is described as: 'easy to build at low cost, but highly unstable, and very noisy'. As if this type of oscillator was not already too noisy for high end audio equipment, some engineers tend to use other gates in the 6 gate package of the 74HCU04 for other control or buffering jobs in the CD player. But each time the level shifts from high to low or low to high in one of the gates, several hundred millivolts of switching noise will appear on the VCC pin. Half of which will turn up on the input of your Pierce oscillator. Amazingly enough this type of clock is used in almost any CD / SACD or DVD player in the world! In some cases the Pierce Oscillator is not built with the 74HCU04 chip, but a similar gate is built into the servo processor or even the D/A converter which is slightly better. Now the problem is that the Pierce Gate doesn't receive noise from 5 other gates, but hundreds or thousands. In other cases a small metal can oscillator is used, this is better as only one gate is present in the 74HCU04 chip inside. However it's still far from good enough, as your oscillator will have a signal / noise ratio of less than 40 dB. Your CD / SACD / DVD player will work and play with all the above clock setups, but not at all with the best possible sound! Jitter is audible! If a CD player has jitter it will sound like the orchestra is placed in a phone booth right between the speakers. If there is less jitter, the sound will appear to come out of the speakers, and the orchestra placed inside each speaker. You can not hear if an instrument is placed in front or behind other instruments, only if it is playing at a higher or lower level. The bass reproduction will be slow and rumbling, with no distinction or details. Wrong! Most people expect that because they paid more money for their player, it is more optimized for performance. This is also what you could expect, but NOT what you get! In many cases the critical parts, D/A converters, transports, error correction circuits etc. are the exact same for one brands cheapest and most expensive model. The difference may be an oversized power supply (which is always good), and a heavier enclosure, with a more high tech look. (Also good). But the real problems with jitter or slow op-amps in the analog stage are unsolved in both the cheap and expensive model. But this gives you the opportunity to start with a cheap player, where you only focus on finding a good design, and the optimizing this player with a good clock, and analog stage. In the end you will end up paying much less than the expensive model, and getting far better sound. We guarantee this! If you find otherwise, you can return the upgrade parts for a full refund! This graphic shows the clock signal in your player, flaws enhanced for visibility. There is noise both in time and voltage domains. The Clock signal from the LClock is much less. The LClock XO 3 is L C Audio Technology's low jitter noise reference Clock. 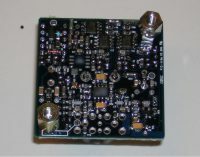 It is built on a small 4 layer circuit board shown above, measuring 44 by 44 mm. (1.73 by 1.73"). It is intended to be installed inside any model CD / SACD or DVD player, or Separate D/A converter, DAT or CD-R recorder. Power is typically supplied from one single 12 V rail found inside most players, or for high end uses, a separate power supply will optimize performance to the last ps. Any voltage from 7 to 18 Volts will do perfectly. The oscillator, is a Collpitts type. (Denominated by ANRR as the most noiseless oscillator type) The oscillator is a pure sine wave oscillator so there are no harmonics, only the oscillator base frequency. The crystal is run in the series resonance mode, to minimize injections of digital noise from the CD player. To ensure the (hand ground precision) crystal is the only frequency controlling device, the active part of the oscillator is a 5 GHz low noise Ultra High Frequency amplifier transistor. Click! As the Collpitts oscillator is a pure sine wave oscillator, the crystal has optimal operation conditions! The reward is jitter levels near as low as the measurable limit! The sine wave is fed through a transconductance coupling to the input of a Voltage Comparator with ultra low phase and voltage noise. Just about the best chip of its kind in the world... As this is one of the most critical parts of the clock generator, this chip has 2 separate power supplies, so the output circuit will not induce noise back to the input stage. Last the square wave signal from the comparator is fed to the input of a high logic buffer, and then directly to the COAX output. All this together with the noise screening 4 layer circuit board is optimized to attempt producing the worlds best CD / SACD / DVD ref. Clock! When you start listening to your LClock'ed player, you will instantly note there is a natural width in the soundstage. Also the visual perception of the music recording is stunning! You can place any instrument in the sound picture, and it seems to fill the room, not like before when it sounded like the instruments were inside the speakers. There is a clear perception of what is in front and what is behind. A recording that seemed grey and dull before, now sounds lively and fresh. In other words the sound stage has become much more 3 dimensional! The bass has more details, seems firmer and with more distinction. The analog stage in your player is most likely made with op-amps of a cheap and poorly performing type, that will not do the rest of the player (or your ears) justification. Types like : NJM2114, NJR2114, NE5532, NJR4558, OP27 etc. make up the analog stage in 90% of all models on the market. They are simply not the best types around any longer, as they were all developed in the 1970's and beginning of 1980's. you will not be surprised if I claim that a lot have happened with silicon chips during the last 20 years. This accounts for op-amps as well, and today much better types are available to replace the above types. OPA275, OP2604, AD711, AD712, a little better, but still in the cheap end. If you invest just a small amount in this part you can get much better liquidity in the high frequencies, and warmth in the voice regions. If you want to go all the way, you can invest in the ZAPfilter 2, it is a pure single end Class A analog stage, that takes over the entire signal processing right from the D/A converter chip to the output plugs. Simply remove the old analog stage. It is a little extra money, but surely worth it, if you are into good sound. We also guarantee this claim with a full satisfaction or money back offer. Page Build Completed in: 0.044 seconds. .